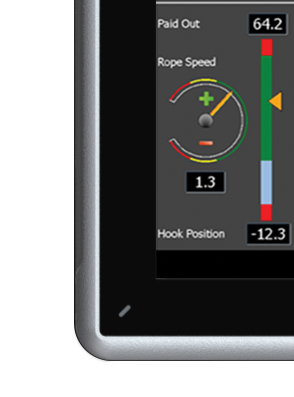 protects the maximum rope pay-out, monitoring "rope end/minimum 5 rev position"
The RSI has been designed to give the crane operator information on hook position and movement. This is especially useful when the hook is not in his line of sight i.e. working sub-sea or "blind". Anti-2-Block prevention is done by constantly monitoring the hook position. The system may give pre-warning when the hook approaches the limit, outputs may force the hoist to be set in "creep speed". The system uses absolute encoders not requiring any parts in the boom tip, eliminating dropped objects. 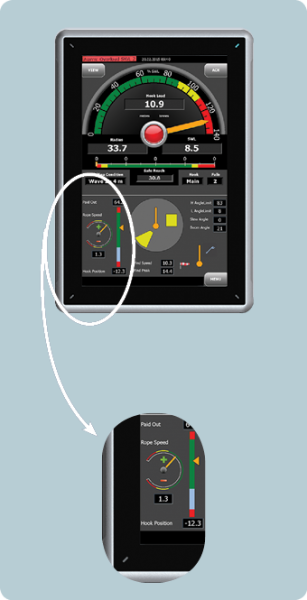 If the crane is equipped with an Automatic Overload Protection System (AOPS), defining the Boat Sector is important to set crane control logic. The Hook Position will be monitored defining the Boat Sector as programmed, below the facility cellar deck.